Wishing you all health and happiness in 2013. 2013? I can’t believe how fast time has flown. Could it be that I’ve already lived in Korea for 2 years?! 헉! And while we all begin to make plans for our big new year’s celebration (lie: I’m not planning on planning a thing), I thought it would be the perfect time to share how I celebrated my new year – of life – during my most delicious birthday ever. It all started one week before my birthday, when G and I were playing a romantical game of cards (Geriatric love, anyone?) and I was complaining about my self-induced pressure to host a party with no venue in mind. By the way, I’m faced with this conundrum every year, which usually results in avoiding the birthday-thing altogether. Because this I know for sure, G has NEVER, in his life, noticed the weather (nor planned a weekend in advance, but I’m not gunna go there). This kid does what he wants, when he wants, rain or shine- making this conversation entirely suspect. I puzzled-ly took the paper from his hands and realized – HOLY SUSHI – G had printed out the weather report for KYOTO! And that is how my surprise birthday weekend in Japan was unveiled. A few days later, G & I landed in Osaka and took the JR WEST train straight to Kyoto (approximately a 75 minute ride). Quick tip #1: Travel to Kyoto is exceptionally easy as the train station is located right outside the airport. Also, foreigners are able to buy discount tickets (Japan West Rail Pass) at the tourist information counter, as seen below. Quick tip #2: Make sure to stop by a 7-Eleven around the airport to pick up some water and Japanese snacks for the journey (ice cream waffle sandwich is our personal favorite). and all juxtapositions aside, it’s really just perfect. We hopped off the train, stashed our backpack in lockers, and immediately set off for our first destination – Nishiki market, Kyoto food mecca. What?! With only 48 hours in Japan, one must seize all Japanese food intake opportunities. Nishiki Market is a narrow, indoor, food market that spans a delectable 5 blocks. The market has over 100 tiny shops and restaurants selling local ingredients and specialized, ready-made food. I have no idea how long we spent eating our way through the market, but every second was delicious. To walk off the few (million) calories absorbed during our foodie-adventures, we headed to Gion, Kyoto’s famous Geisha district. There, we purposely lost ourselves in the beautifully preserved streets, peeping into dimly-lit tea houses, and finding treasures as we explored. We were also lucky enough to spot a few Geishas, who hurriedly walked past the swarming, paparazzi-like tourists. At the East end of Gion’s main touristy-street, Shijō-dōri, we stumbled across the Yasaka Shrine. This was just the first of many religious places we stumbled upon in Kyoto- a city packed with over 1,600 Buddhist temples and 400 Shinto shrines. Part II in the works! A birthday trip to Kyoto?!? Awesome to the max! Thanks Roomaomao! I know – it was an unbelievable experience. One of these days I’ll make it over to Japan. When _are_ you gonna finally redeem all those years spent in korea and drag G for a couple of years in the holy land?? 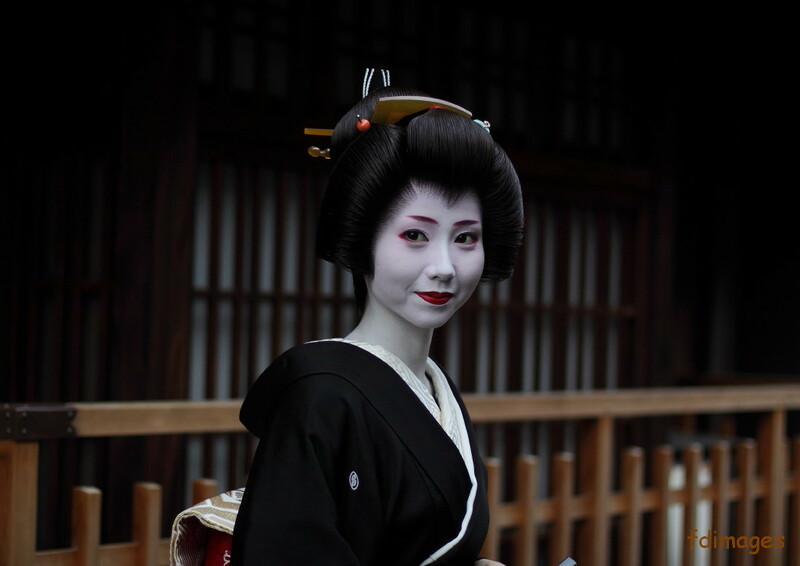 Moushifj, you are totally right about Geishas being called Geiko in Kyoto – I wish I would have remembered to weave that into the blog! As for being a Maiko, how can you tell? I’d love to know! Moushifj, I’m so impressed by your knowledge. Thanks for sharing this information! I did see a few more Geiko/Maiko on the street/running into cars that I didn’t have time to photograph (unfortunately, my camera broke so all the photos were snapped on the iPhone). Now I wish I had those photos to identify their position. But sadly she has retired quite a bit ago. These girls are so famous and so sought after by photographers that a group of people have volunteered to protect them. People have actually tried to touch them and pull on their kimono which is absolutely unthinkable! Most geisha though, are able to handle themselves, luckily.